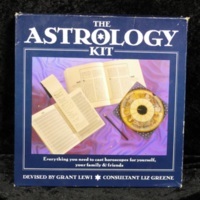 This astrology "kit" (sold by St. Martin's Press) contains everything that one needs to familiar themselves with the process of predicting and crafting ones' ideal horoscopes and fortune-based outcomes. According to the box, the kit contains a Zodiac Wheel, Table of Years, Book of Readings, a notepad, and a pencil. Grant Levi and Liz Greene, “Astrology kit,” The Skeptiseum, accessed April 19, 2019, http://skeptiseum.org/items/show/400.